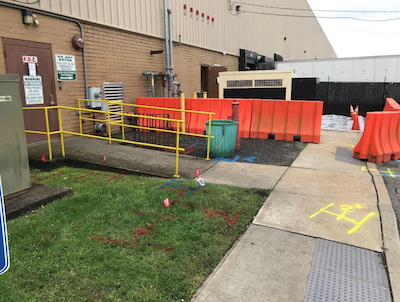 At a commercial property located in Bayport, New York a contractor contacted GPRS to conduct ground penetrating radar scans of a property to locate any possible utilities centered on a recent fuel oil release from an Aboveground Storage Tank (AST). The property owner, were concerned about utility in the area of the environmental cleanup. GPRS was able to perform the scans in a timely manner and detect multiple utilities which were marked on the surface in colored marking paint in order to allow the contractor to work safely. For more information or a quote about a job in New York City, Long Island, and Northern New Jersey, contact Dennis Berthold at (929)418-0069 or dennis.berthold@gprsinc.com. Visit our website at www.gp-radar.com.